Day Two, "Feb 3rd, 2018", exclusive live in concert by Maestro isaignani ilayaraja's & his orchestra. Mesmerising hits on live performances. India film industry &, musicianship with various playback singers performing. Best of best in celebrating magical 75 years journey of our maestro isaignani ilayaraja's endless music journey. Children above 3 years require a ticket. Rights of admission into the Venue is reserved at the Organizer's sole discretion, even to valid ticket holders. Tickets once sold cannot be returned. No refund on a purchased ticket is possible even in any case of rescheduling of the Event. Appropriate standards of behavior are expected of all persons attending the Event and persons deemed to be behaving in a manner that is dangerous or unacceptable in the opinion of organizers or its agents or contractors, will be refused admission and/or removed from the Venue with no refund on the Ticket. Activities such as ‘stage diving’,‘moshing’, climbing’ and ‘crowd surfing’ are strictly prohibited for your own safety. Beware of a fake/color/photocopy of tickets; organizers are not responsible if tickets are resold. Tickets shall not be valid if the bar-code is tampered with. Unlawful resale of tickets could lead to seizure or canceling without refund. Sale of goods or unauthorized trading of any products/ tickets will result in immediate expulsion from the venue. Organizers or any of the staff or associates are not liable for theft, injury, damage or losses suffered at or as a result of the event or any part of it. The attendees voluntarily assume all risks and dangers incidental to a The event, whether occurring before, during or after the Event, and you waive any claims for loss, damage, personal injury or death against the Organizer, the management of the Organizer, any agent of the Organizer, the performing artist(s), participants, and all of their respective parents, affiliated entities, agents, officers, directors, owners and employees on behalf of yourself and any minor accompanying you or for whom you purchased a Ticket. The Event attendees bear the risk of inclement weather. The unauthorized use of any professional photographic, video and/or sound recording equipment is prohibited. Please note that CCTV and film cameras may be present at the Venue. By purchasing Tickets and attending the Event, the attendee's consent to being filmed, photographed, videotaped, or otherwise recorded, and that the attendees’ name, voice, and likeness may be broadcasted, displayed or distributed (commercial or otherwise) without any compensation being paid to the patron. There are to be no pass-outs or re-admissions after you exit the gates of a Venue (after entry) and such attendee will not be permitted to re-enter the Venue. Cameras any form of recording instruments, arms and ammunition, cigarettes, matchboxes, animals, eatables, water bottles, beverages, alcohol, luggage, backpacks, handbags and other baggage are not allowed. 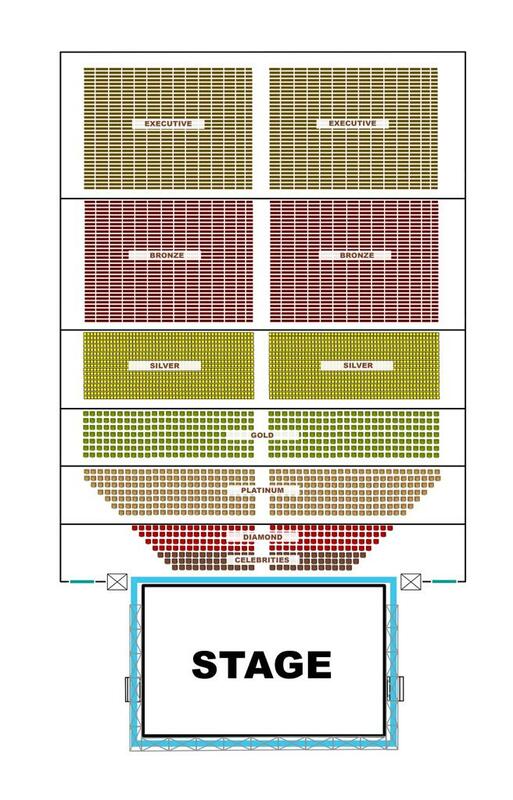 VENUE LAYOUT SHOWN ARE FOR ILLUSTRATION PURPOSE ONLY. ACTUAL LAYOUT MAY VARY.